Click the Product Ticket Tab to create a new ticket for a product, as shown on the screen below. You will enter all requested information and then click on SUBMIT TICKET to create a new ticket. If you want to cancel the ticket before submitting, click on CANCEL TICKET. The Date and time will save to the ticket automatically. Upload Photo allows user to upload a picture associated to the ticket. Commodity type is a drop down select with an �other� option. 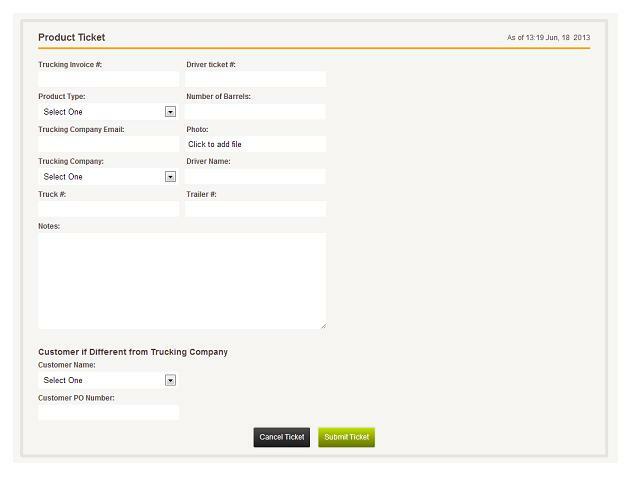 If Other is chosen the form will ajax in a field captioned �Other Commodity Type� and �Charge Per� these fields will save with the ticket but not be automatically be added to drop down list. The rest of the fields are text fields that are required to submit the ticket.